Title: Official XVIDIA Nintendo Wii Component High Definition Cable supporting HDTV / AV Plus Original Apple iPOD Pink Sock (see photo)! Official XVIDIAâ"¢ PSP2000 Neoprene Soft Woven Slip Sleeve Pouch (Light Blue) for Sony PSP Slim 2000 Plus Original Apple iPOD Pink Sock (see photo)! Official XVIDIAâ"¢ PSP2000 Neoprene Soft Woven Slip Sleeve Pouch (Silver) for Sony PSP Slim 2000 Plus Original Apple iPOD Pink Sock (see photo)! 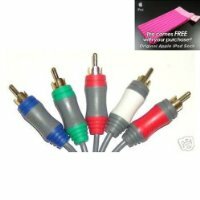 Official XVIDIA Xbox 360 VGA 2RCA Component Audio Cable for X Box / XBOX360 Plus Original Apple iPOD Pink Sock (see photo)! Official XVIDIA iPOD 5in1 LCD Digital Fm Radio Wireless Transmitter Kit, Car Charger & Holder/Cradle for all Apple iPODs inc. Nano, Video 30GB/60GB/80GB, Photo & iPHONE Plus Original Apple iPOD Pink Sock (see photo)! Official XVIDIA Sony PSP Metal Aluminium Luxury Hard Deluxe Case in Silver and Game / UMD Holder Plus Original Apple iPOD Pink Sock (see photo)! Official XVIDIA Nintendo Wii Aero Carry Case / Bag For Remote & Nunchuk Plus Original Apple iPOD Pink Sock (see photo)! Official XVIDIA Xbox 360 Wireless Control Rechargeable Battery 1800M for X Box / XBOX360 Plus Original Apple iPOD Pink Sock (see photo)! Official XVIDIAâ"¢ Premium Clear iPhone 8GB Crystal Case with belt clip Plus Original Apple iPOD Pink Sock (see photo)! Official XVIDIA iPOD White Stereo Headphones / Earphones Plus Spare Ibuds to fit all Apple iPODs inc. Nano, Video 30GB/60GB/80GB, Photo & iPHONE and also Creative (MP3) Vision M and other MP3 players. Plus Original Apple iPOD Pink Sock (see photo)!